Laser decay detection uses a device called DIAGNOcam that helps the dentist detect the presence of tooth decay in its earliest stage. Tiny lesions are detected before they have the chance to cause sensitivity and pain. This will help to safeguard and preserve the tooth structure while providing early intervention. By identifying smaller cavities, laser dentistry can help to preserve a greater amount of biological tooth material, as the cavities may require smaller restorations and less removal of healthy enamel. In cases where decay is prevented from advancing significantly, it may even help to save the tooth from extraction or Root Canal Treatments! The laser detection tool releases safe, painless, non-invasive pulses of light through the tooth structure. It uses the body of the tooth as a light conductor. Simultaneously, a digital video camera, captures the context. The device emits a pulsed beam of a defined wavelength that is directed onto the tooth. 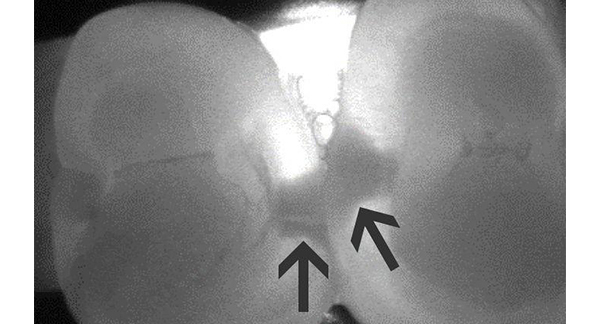 Healthy tooth structure exhibits little to no “fluorescence”. Decayed tooth structure exhibits fluorescence that increases proportionate to the degree of decay. The laser device can detect cavities smaller than the tip of a dental explorer, the typical probe in the dental tray, which makes it significantly more accurate. Aren’t dental probes and X-rays enough to detect cavities? Although the fluoride ingredient in toothpastes and water strengthens tooth enamel and makes teeth more resistant to decay, it fails to offer effective protection for the pits and fissures on the chewing surface of teeth. The use of conventional diagnostic tools like x-rays may not offer sufficient information to detect cavities in regions which are hidden from clinical view. Due to the location and size of the decay, dental probes, at times, may too bulky to detect cavities. In particular, caries detection in pits and fissures is difficult because tooth surface often appears intact. The DiagnoCam’s laser provides pin-point accurate evaluation of the tooth’s actual condition, even where conventional techniques may be unable to detect newly formed and initial caries/decay. To book your appointment, please give us a call on 99898565 or book online at www.normanhurstdental.com.au. Our friendly team is committed to providing you with high quality care.